Mango sticky rice always makes me think of one of my first (and best) flatmates, the lovely Hilaire. She had lived in Malaysia for a year growing up and this had influenced her cooking style and tastes. We were pretty well-fed students! She was also great at doing dishes (I wasn’t). One day she got it into her head to make mango sticky rice. Christchurch was full of Chinese/Asian groceries so the glutinous rice was easy to find. Another fantastic find was a huge bag of frozen mango halves for dirt cheap. We ate so much mango, it went into smoothies, sorbet, lassi, and anything else we could think of. Unfortunately the mango sticky rice was a disaster. We didn’t have a recipe (it was before the days of widely available recipes on the internet, although I did start my first food blog in 2002). What we didn’t know was that it is really difficult to cook rice in coconut milk. It just doesn’t seem to cook! Don’t ask me why. And it hasn’t stopped me trying again, either… My cheater’s way is to add a couple of spoonfuls of coconut milk powder to cooked rice. Anyway, fast forward a decade later. 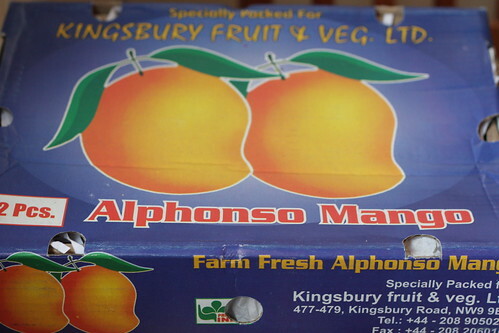 London has something that wasn’t available in Christchurch back then and that’s Alphonso mangoes. My one, guilty, air-freighted pleasure. For a few short weeks every year they turn up in the Indian Spice Shop around the corner. With their highly perfumed aroma and melting texture they are irresistible. If mango is the king of fruits then the Alphonso is Emperor. 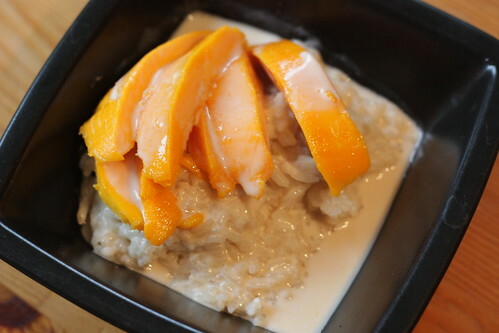 I happened to have a bag of Thai glutinous rice sitting around in a cupboard, so I thought mango sticky rice might be a good way to use up some of my box. I’m happy to say it went a lot better this time! Since I don’t have room for a rice cooker in my kitchen I cook rice in the microwave. It’s my Mum’s trick; as a working mother she was one of the first in our neighbourhood to have a microwave and armed with the cookbook it came with she quickly became a very proficient microwave cook. The trick is to use a very large casserole dish (or similar) – it stops the water from boiling over. Use a cup of rice and just over a cup of water. Let it soak for as long you can bear (a quarter of an hour is ok), then microwave on high in three-minute increments until it’s cooked. Meanwhile, empty a tin of coconut milk into a saucepan and gently heat through, adding a couple of spoonfuls of sugar and a pinch of salt. Pour most of this over the cooked rice, give it a quick stir and then cover, to let the rice absorb the milk. Chop up some mango, and then assemble: Put a mound of rice in a bowl, top with sliced mango, and then a splash of the reserved coconut milk. 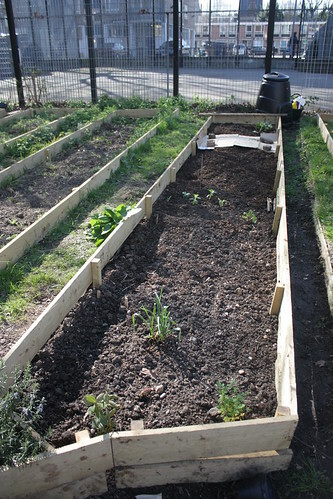 A few weeks ago I took possession of a small plot on a new community garden on my estate. As you can see, not much growing yet, but it’s coming along! I’m really enjoying the other aspects of it too – the real sense of community that it brings. This is a large, inner-city council estate. It is very diverse and that is reflected in the makeup of our club – we have 26 members from 11 different countries. I’ve lived here for three years without knowing anyone except my next door neighbours. Now I know loads of people! Yesterday a neighbour knocked on my door and gave me some onion sets. Last weekend I was guerilla gardening outside my building and another neighbour introduced himself and joined in – so I knocked on the door of yet another neighbour to borrow a fork for him to use. I now bump into people I know on the street, and it’s lovely. Now I just need the food to start growing…. 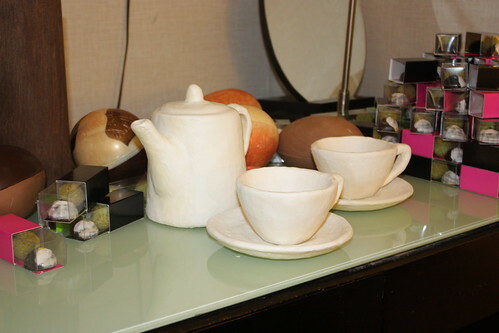 What better Easter post than to write about a chocolate hotel room? 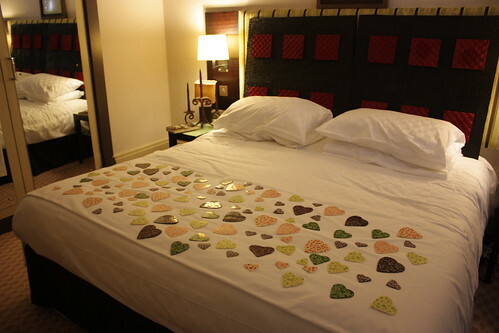 The folks at the Cavendish Hotel decided it would make a fun promotion to create a chocolate hotel room, with one lucky couple getting to sleep in the room and gorge themselves on as much chocolate as they could eat. I love it when businesses do something creative like that, especially as they teamed up with students from Westminster Kingsway college, who created the decor out of 100kg of Callebaut chocolate. 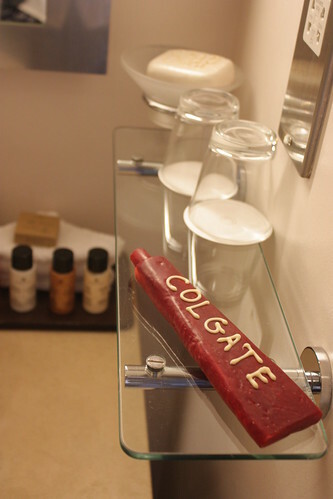 And my favourite – chocolate toothpaste. A dentist’s nightmare! 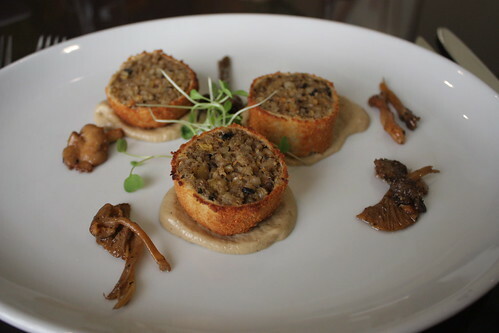 Vegetarian haggis croquette, with mushroom purée. This was the winner, honestly. The best and most original vegetarian option I have seen in some time. 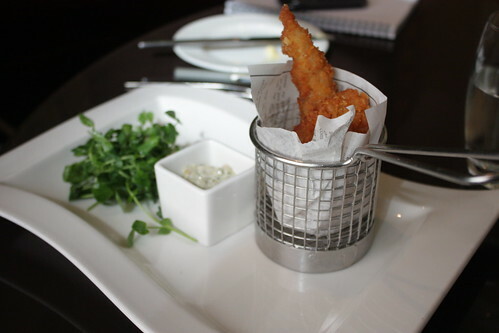 Breaded plaice was crispy and delicious. My main of trout was also very good (but I’m still dreaming of the haggis). It should be noted that the restaurant has three stars from the Sustainable Restaurant Association, which is really quite an achievement. The Cavendish is on Jermyn Street behind Fortnum and Mason, and I think it would be a really good place to take visitors for lunch or pre-theatre. 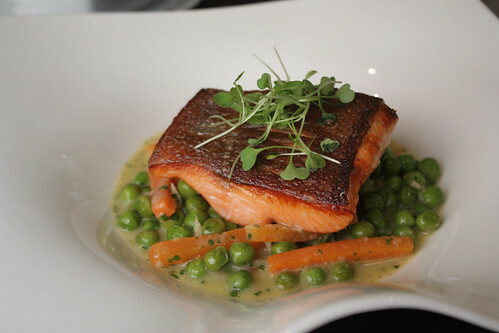 The best of British – and great value at £19.50 for three courses. Out of the five, the banana, mango and Brazil nut bar was my favourite, which was quite surprising as I’m not the biggest banana fan in the world. The flapjacks are probably best for people with a sweet tooth – the apple & sultana flapjacks in particular were very sweet. The crispy chocolate & rice bar was a good treat, delivering a proper dark chocolatey hit. I think these bars would make a great school lunchbox treat for anyone who wants to give their kids real food. Although they’re definitely good for a grown-up energy-boosting snack too!